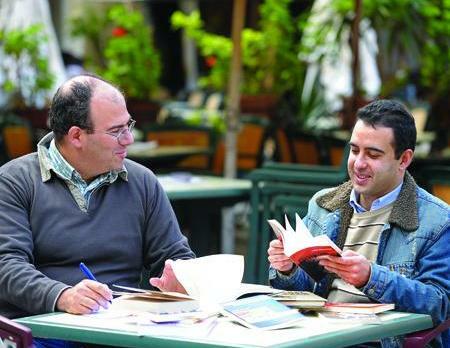 Patrick Sammut and Stephen Cachia believe that poetry brings you face to face with reality. For some reason the word “poet” makes me think of men in tights, cloak, pointed shoes, and all set with plume in hand, with an audience of people cosily dosing off. I know I watch too many movies, thank you very much. But it’s either that or Rużar Briffa which comes to mind at the word “poet”. Somehow, of all the artists, I think poets are the ones that make us give a sharp intake of breath if they don’t fall under the very rigid picture we have of them. And this first burst sets the dynamic for the rest of the interview: Stephen is the one who pounces to answer my questions and peppers his replies with such semitically-romantic Maltese words that I have to mentally press pause and guess their meaning from the context. Patrick is the one who ponders before giving a punchy but non-nonsense statement. Halfway through I wanted to pack away my notebook, postpone the interview and lose myself in the upbeat debate which ensued. Forget about dozing off, this I can truly say: modern poets fully charge your thinking batteries. By the end of the evening we reached the conclusion that a person who writes poetry is someone who feels the urge to put to paper that which he sees and feels, in the form of melody. Patrick believes that you are born a poetry writer. “It has to be in you. But then again, you don’t necessarily carry it all your life. Take Arthur Rimbaud – halfway through his life he stopped writing.” They go on a roll, mentioning other ‘born’ poets, who strongly influence them: Federico Garcia Lorca (Spanish); Achille Mizzi (Maltese); Oliver Friggieri (Maltese); Nazim Aikment (Turk); Pablo Neruda (Chilean) – and how through their poetry you could just reach out to beauty, maturity and whatever else is invoked by their pens. So why is it I ask, that we, the majority of people, don’t get this? Why is it that many of us don’t reach out for poetry, dismissing it immediately as something we don’t particularly understand? If a piece of poetry is good than it would appeal to anyone, claims Stephen: “But then again it depends on the reader and what he is looking for: Is he reading poetry just for pleasure or to try and find meaning in life?” Patrick further explains that at times readers can identify with a poem because it deals with a topical issue or if it takes a dig at authority. Current affairs motivates them to write, in fact two powerful pieces of Patrick’s talk about the Kursk submarine accident and 9/11; Kosovo made Stephen reach out for his pen. “People tend to say that they’re not into poetry, but they forget that even a TV advert can be a poem. Anything around us can be poetry: Music, cinema, posters, designs … anything that makes us stop and reflect is poetry … you just have to be open to it,” says Patrick, “everybody eats Baci chocolate – everybody reads the bit of poetry on those little slips of paper; or the quotations on the Krystal water, or Friggieri’s lines on the bus stops … we all read poetry in some form or other”. Aha, I say. So you’re saying I’m, err, intellectually challenged because I don’t happen to like Pablo Picasso’s art, for example? This nerd thing is a myth they say, just like other typical labels: “Poets are lazy people”, “Poets live in a world of their own”. Stephen insists that poetry brings you face to face with reality. “A poet lives in the present, ponders the past and thinks of the future,” says Patrick. Someone who is in touch with the poetry around him is definitely more sensitive to society because of his nature. So if everyone was a poet, would it be a completely peaceful world? They don’t say anything but their look says it all: Duh! They both acknowledge that, however, writing poetry is painful. “It’s hard work, it’s a long process, you have to nurture your muse or else it dries up. You have to transfer images into words. Sometimes you have to wake up in the middle of the night. But it’s not something which you can choose not to do. You just have to do it, like when you’re thirsty, you have to drink,” says Stephen. So would they want their kids to be writers of poetry? “I would just want them to love books. I’d be happy with just that,” says Patrick and Stephen nods in agreement.